In a recent op-ed in The Wall Street Journal, MIT's new president Leo Rafael Reif argued that higher education is facing a crossroads the likes of which it hasn't seen in about 500 years. In a recent op-ed in The Wall Street Journal, MIT's new president Leo Rafael Reif argued that higher education is facing a crossroads the likes of which it hasn't seen in about 500 years. Not since the invention of the printing press, he wrote, has academia seen technological disruption as pronounced as what we are seeing right now. Reif was talking about blossoming on- line learning technologies. What's more, higher education has got a long-simmering financial problem that's coming to a boil. Let's start with online education. At MIT and on campuses around the world, people have, for more than 10 years, been exploring how to use technology to offer education inexpensively to anyone with Internet access. What's new in the past couple of years is technology that allows online learning, which is truly tailored to the medium of the Web. It's not just about posting recorded lectures and reading material anymore - it's about creating an interactive experience that puts the learner in control of the pace and even style of learning, and quizzes students to make sure the material is understood. It is also about creating massive networks of students who can communicate across oceans as they master material together. It is a great story, but not one without peril. When MIT launched its online learning initiative last winter, MITx, and when Harvard University and MIT announced we were launching edX, an online learning platform that would offer the teaching of our universities at low or no cost, we knew we had to be emphatic on one point: that we were as interested in what online learning technology could do on our campuses as we were in using it to offer higher education on a scale humanity has never seen. Why is this focus on the campus so important to us at MIT? Two reasons. First, we still believe the residential model of education is the best the world has to offer and that online technologies can be blended into the way we teach on campus in order to strengthen our core. We never try to speak about Web education solely as it bears on purely online learners. Second, our research endeavor is vitally important both for what it offers our students and for what it offers our nation and the world. We must continue to demonstrate and advocate for the value of basic research. Its return on investment - in companies formed, breakthroughs patented and turned into products, and in advances central to the very defense of nations - is one of history's great achievements. For economies that run on innovation, research is fuel and if universities are underfunded, it cannot be made. For that reason, news about peer-reviewed research will remain at the core of what we share with the public and the media. Now to the tougher story. The financial crisis facing higher education is an emotional and central part of the national conversation. Every day, the public reads stories about students loaded up with ruinous debt, unable to find work, and bitter about a system that seems to have failed them. There's a lesser-told story that matters here: universities spend more to educate students than they receive in tuition. MIT spends three times as much as it receives in net tuition, which is tuition minus financial aid. On both sides of the exchange, there's pain. MIT is careful in how it comments publicly about the financial crisis, in large part because it's in the fortunate position of having an endowment large enough to allow it to admit students without consideration of their ability to pay, and to give generous financial aid to students who need it. President Reif said the trends toward higher cost, for both the student and the university, must be addressed. He is interested in exploring how MITx may influence the residential model of education and help sustain our operations. He wants to see whether the positive trend in online learning can change the negative pattern in the cost of higher education. If MIT and fellow research universities can tell how online education has the power to democratize higher education while it reinvigorates the campus experience and alleviates the financial strain of education, we will show that though we believe our missions to be priceless, we know their fulfillment can't come at infinite cost. 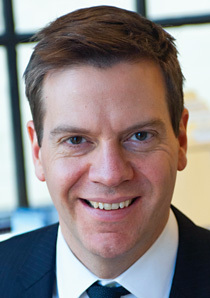 Nate Nickerson became editorial director of MIT's news office in 2009, before he took the role of communications director in April 2010.